This lovely villa has two master en-suites bedrooms, pool & spa, can be heated for addtional charge, new kitchen appliances, games room, flat screen TV in every room and free wi-fi internet. Also, it has one king master en-suite bedroom and one queen en-suite master bedroom as well as one bedroom with twin bunkbeds and one bedroom with two twin beds. There is upgraded flooring throughout the home, has complete furnishings and appliances. In addition, there is a completely refurbished pool & spa with spacious lanai for you to enjoy. There is also a games room with table tennis and electronic dart board. A high chair, babycot and child fence around the pool perfectly round off the ammenities for a great vacation! This great property is located in a prestigious gated community with a clubhouse, which includes a games room and fitness center, kids play area, a tennis court and beach-volleyball area. Book this home now and enjoy a memorable vacation! 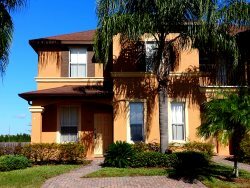 This property is ideally located in the renowned gated community of Tuscan Hills, minutes from Disney World, shopping and dinning areas and other famous theme parks and attractions. The community has a clubhouse, which includes a games room and fitness center, kids play area, a tennis court and volleyball area.